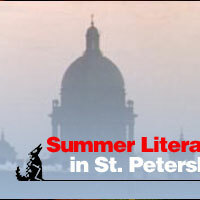 This year's Summer Literary Seminar in St. Petersburg includes a week-long hypertext seminar led by Noah Wardrip-Fruin. Applications will be accepted on a rolling basis through April. I was just reading the latest fiction on fray.com when I came across Fireworks by John Pnim. The author of this story writes with a disturbing intensity about the war in Iraq. The characters include: a paramedic student, a woman who has just attempted suicide (her husband was killed in combat two months earlier), and a nurse who has a husband still fighting in Iraq. The nurse, who believes that the war is just, tries to comfort the suicidal woman by telling her that her husband died doing "good work, fighting for freedom." The woman is livid when the nurse says this because she hates the war and President Bush who she blames for the death of her husband. She spits on the nurse. The nurse sees the patient as "imbalanced" and the patient sees the nurse as naïve. Meanwhile, the paramedic stands by, letting all of this all happen, paralyzed into silence by helplessness and a fear of adding to the conflict between the nurse and the patient. He thinks that the nurse is wrong, but he knows that no amount of convincing is going to sway either woman's viewpoint. This story could really be an analogy for my relationship with my parents. Aside from short, awkward phone calls on holidays and birthdays, I haven't spoken to them in years. I think that just like the paramedic, our past has been so filled with conflict that it's easier for us to not talk than to talk because we are afraid of opening up those old wounds that just never heal. The other day, I was at Starbucks with my friend Madison, drinking a white mocha latté when these two guys came into the coffee shop. One of them was tall with dark hair. His eyes and nose gave him a rooster-like appearance. The other was more handsome, well-built, rugged, and blonde. They ordered their drinks and sat down at the table right next to us. I guess that one of them recognized her from the bookstore and immediately, both of them started to flirt with her. I could tell that she was really enjoying the attention. Since the conversation evolved mostly around Madison and the bookstore, my eyes and my mind started to wander a bit. I noticed two young parents with a tiny baby girl sitting in the corner. They were goo-goo-ing and goo-gah-ing over her. It made me think back to my own parents—I wonder if they were ever excited to have me around.